I previously discussed the Aleut Internment of WWII, in which many Native Alaskans were relocated to Funter Bay to “protect” them from the Japanese invasion of the Aleutian islands. Evacuees were shuffled out of the combat theater for the military’s convenience, and left in hastily-organized camps at disused cannery and mine sites. Conditions at the internment camps were poor, with unreliable water, heat, and medical care. Approximately 30-40 people died in the two Funter Bay camps, with more deaths at Juneau hospitals. 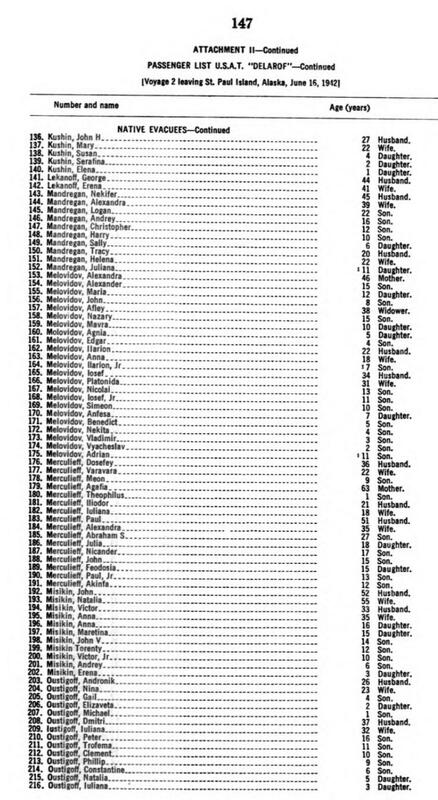 The Funter Bay cemetery holds approximately 23 recognizable grave sites, although the list below indicates 35 burials there. 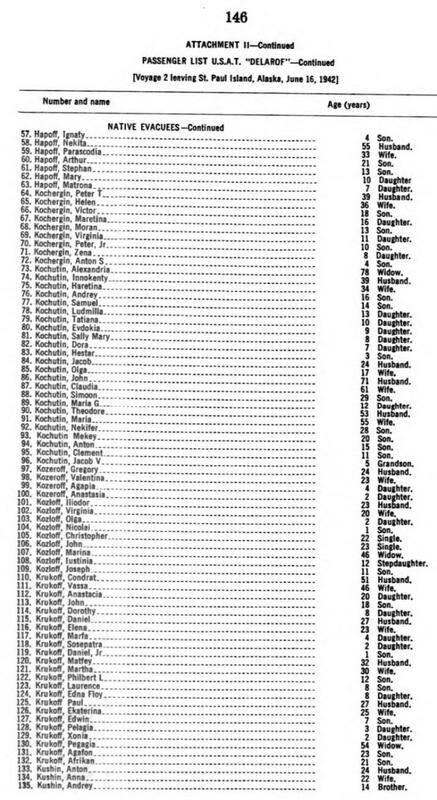 This list is from a 1980 report by the Commission on Wartime Relocation and Internment of Civilians, in hearings before the Subcommittee on Administrative Law Relations, regarding establishment of said commission and payment to victims of forcible relocation by the government. The full text is available via the Library of Congress here, in scanned and OCR’d form. I have copied the OCR version below. Obvious scanning and text recognition errors have been cleaned up, but there may be a few errors remaining. 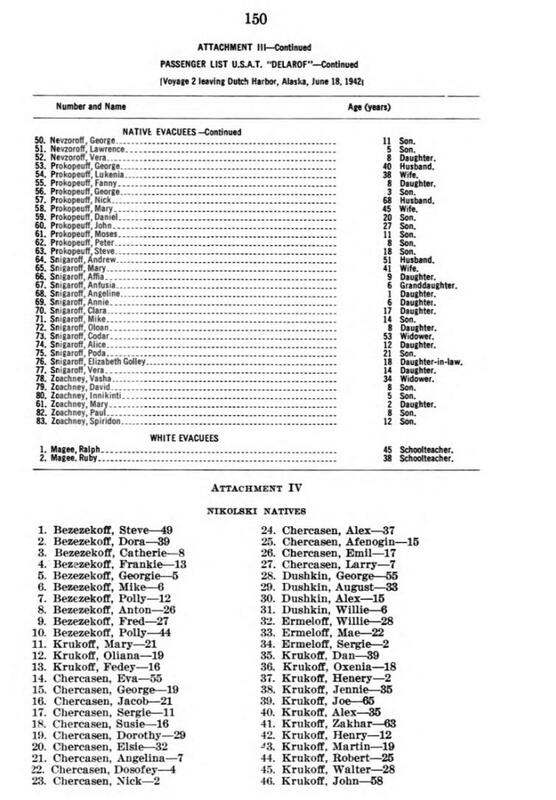 Full lists of evacuees transported on the Delarof to Funter Bay (the St. Paul and St. George Island lists) are at the bottom of this page. Galanin, Sr., Alexander. Buried at Funter Bay, Alaska. 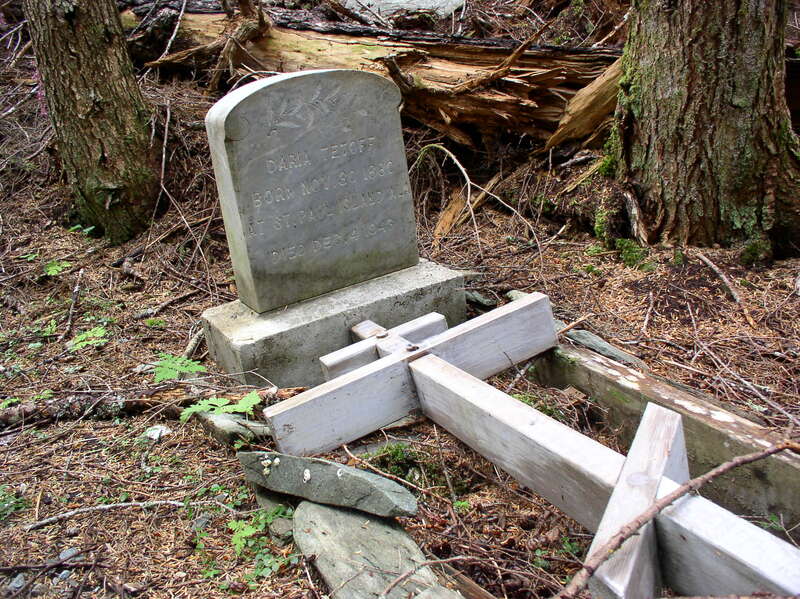 Lekanof, Irene, Buried at Funter Bay, Alaska. Lekanof, Palagalia, Buried at Funter Bay, Alaska. Lekanoff, Polagin, Buried at Funter Bay, Alaska. Lekanof, Jr., Serge, Buried at Funter Bay, Alaska. 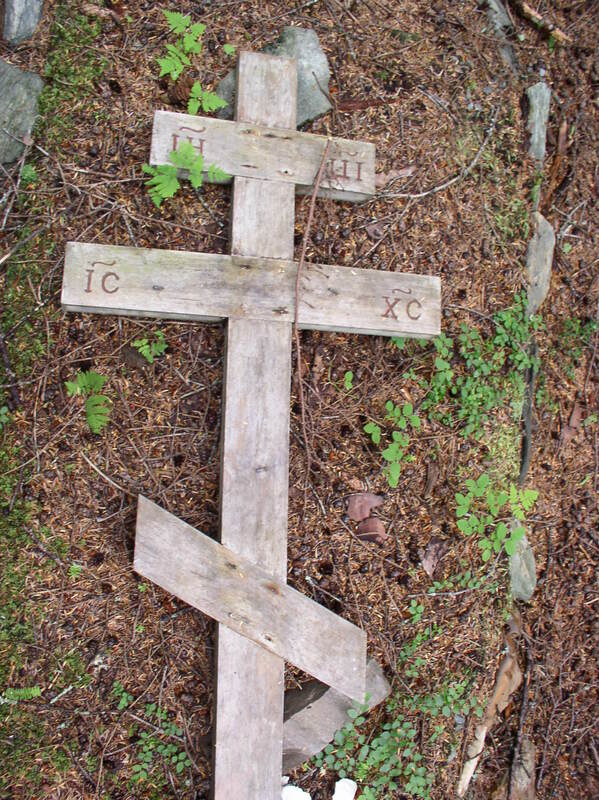 Lestenkof, Constantine, Buried at Funter Bay, Alaska. Mandregan, Helen, Buried at Funter Bay, Alaska. Nozekof, Mary, Buried at Funter Bay, Alaska. Nozekof, Paul, Buried at Funter Bay, Alaska. Prokopiof, Jr., Afanasia, Buried at Funter Bay, Alaska. 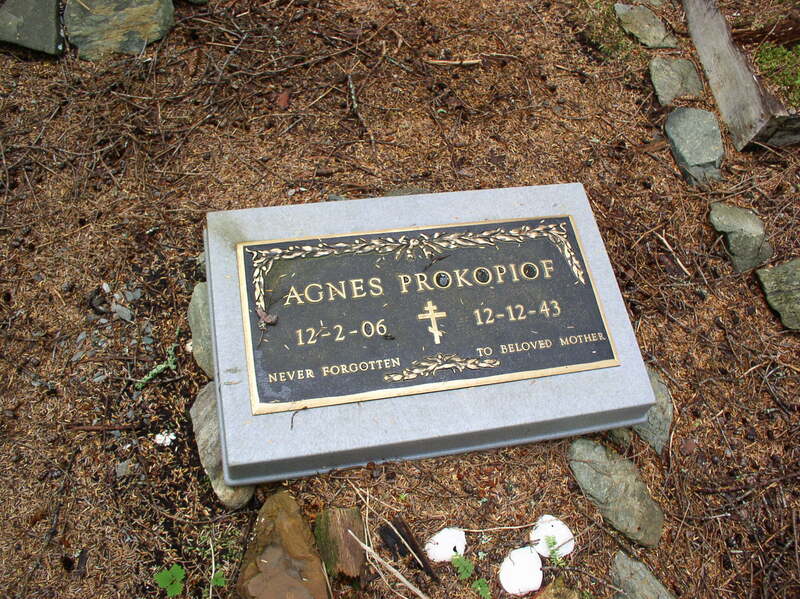 Profopiof, Agnes, Buried at Funter Bay, Alaska. Prokopiof, Anna, Buried at Funter Bay, Alaska. 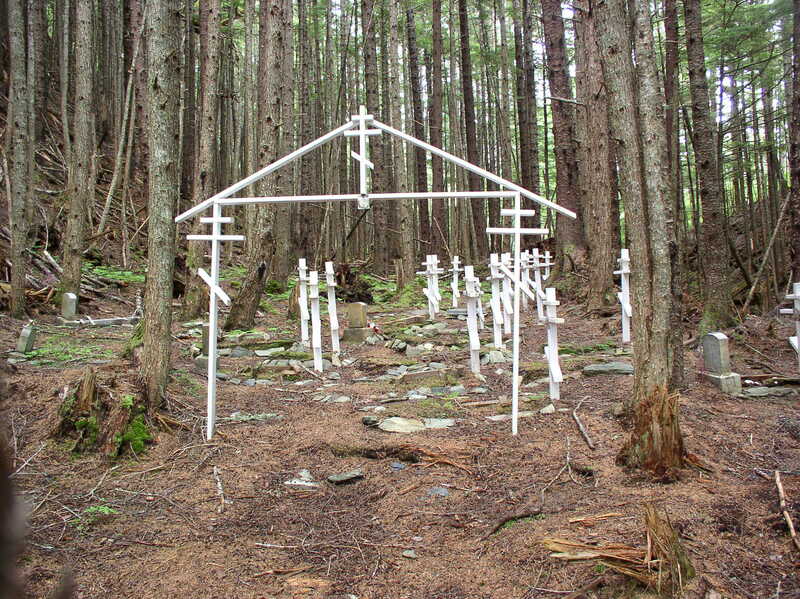 Prokopiof, Lucy, Buried at Funter Bay, Alaska. Prokopiof, Stefanadia, Buried at Funter Bay, Alaska. Swetzof, Olga, Buried in Funter Bay, Alaska. Bear, Kenneth, Buried at Funter Bay, Alaska. Bear, Susan Delia, Buried at Funter Bay, Alaska. 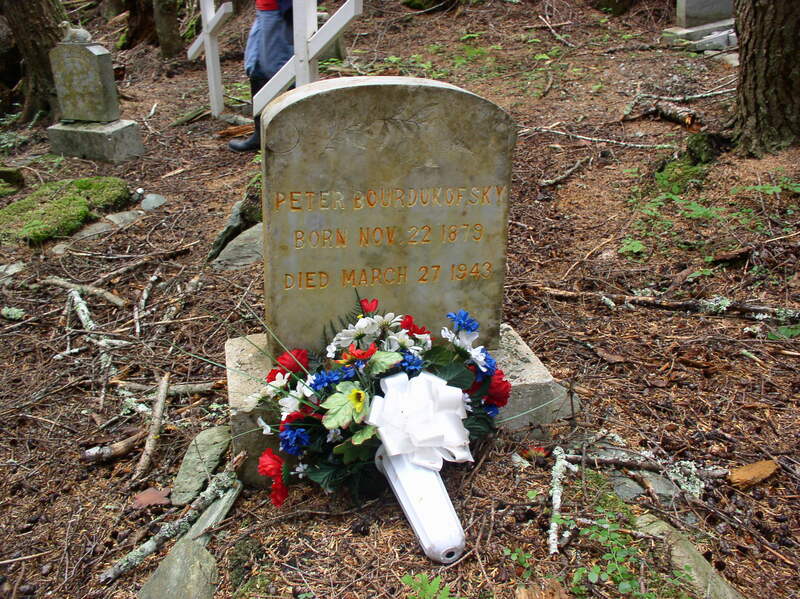 Bourdukofsky, Peter, Buried at Funter Bay, Alaska. 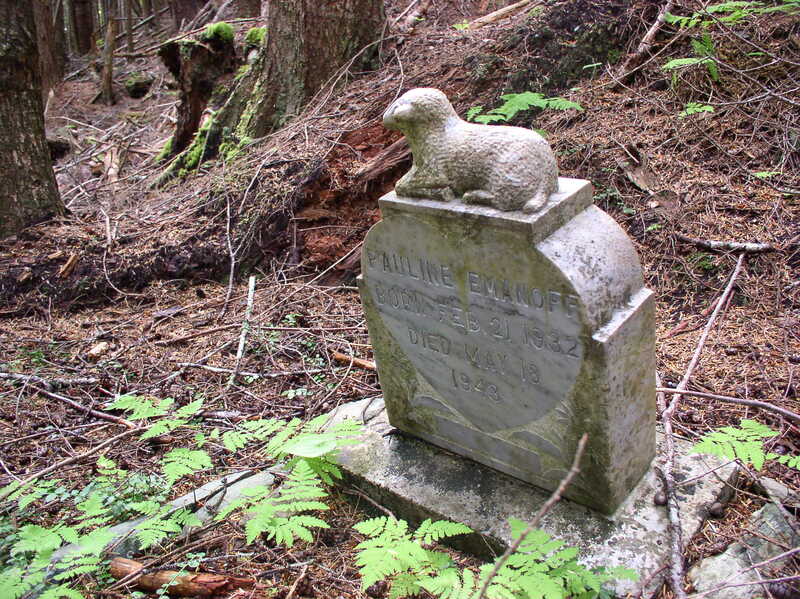 Emanoff, Pauline, Buried at Funter Bay, Alaska. Emanoff, Buried at Funter Bay, Alaska. Emanoff, Polly, Buried at Funter Bay, Alaska. Hapoff, N’ekita, Buried at Funter Bay. Alaska. 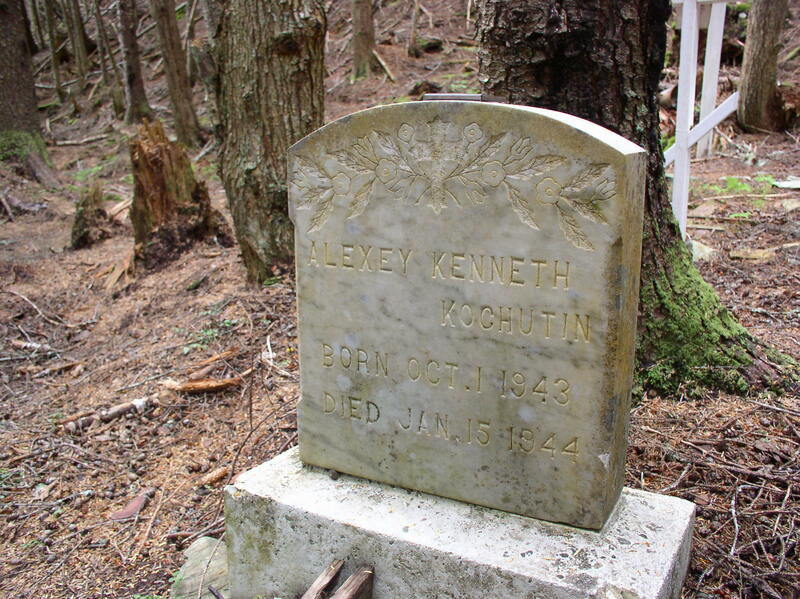 Kochutin, Buried at Funter Bay, Alaska. 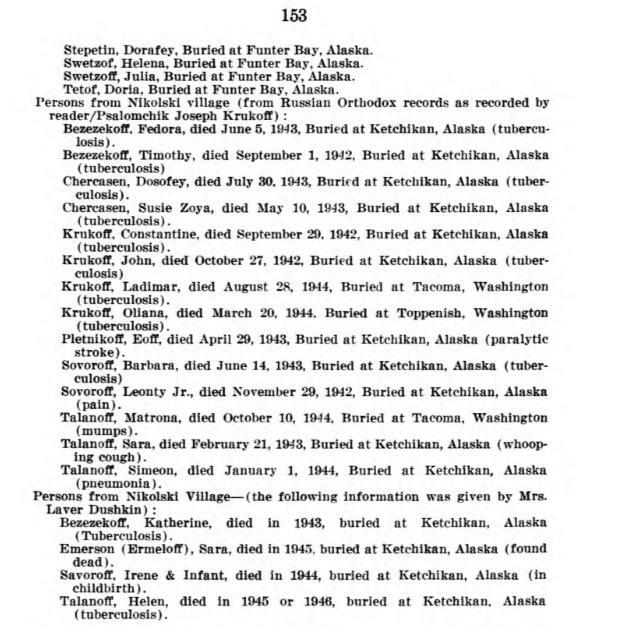 Krykoff, Dorothy, Buried at Funter Bay, Alaska. 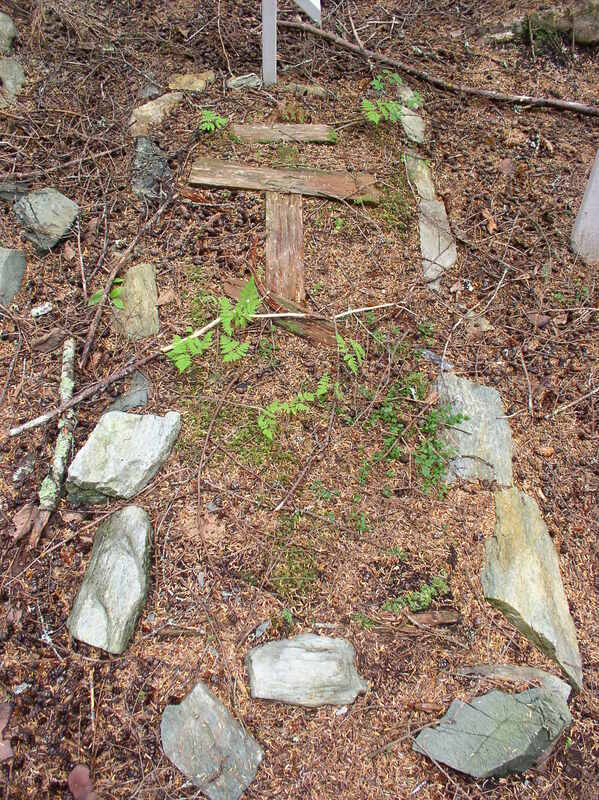 Kuchutin, John, Buried at Funter Bay, Alaska. Mandregan, Logan, Buried at Funter Bay, Alaska. 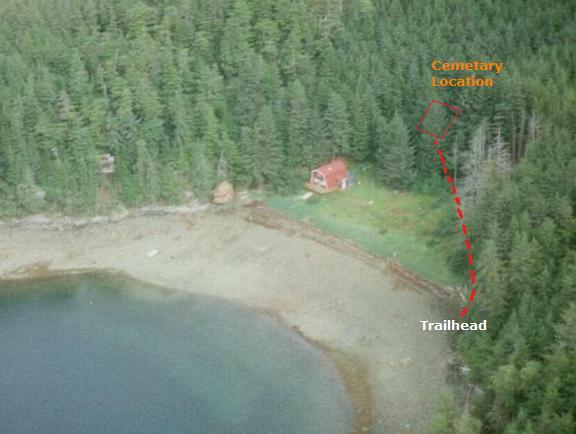 Nederazof, Alexander, Buried at Funter Bay, Alaska. 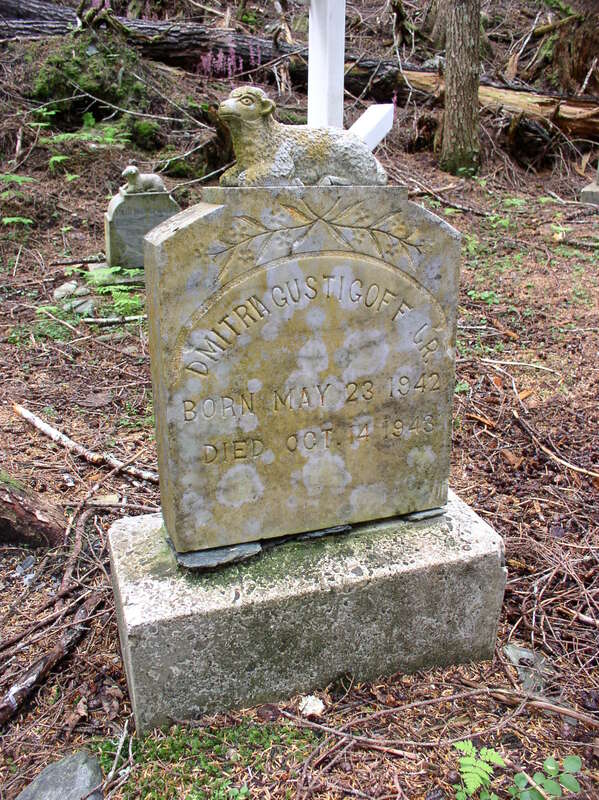 Ousligoff, Anastasia, Buried at Funter Bay, Alaska. Panoff. Vlass, Buried at Funter Bay, Alaska. Shabolin, Serge, Buried at Funter Bay, Alaska. Shabolin, Vlass, Buried at Funter Bay, Alaska. Stepetin, Dorafey, Burled at Funter Bay, Alaska. 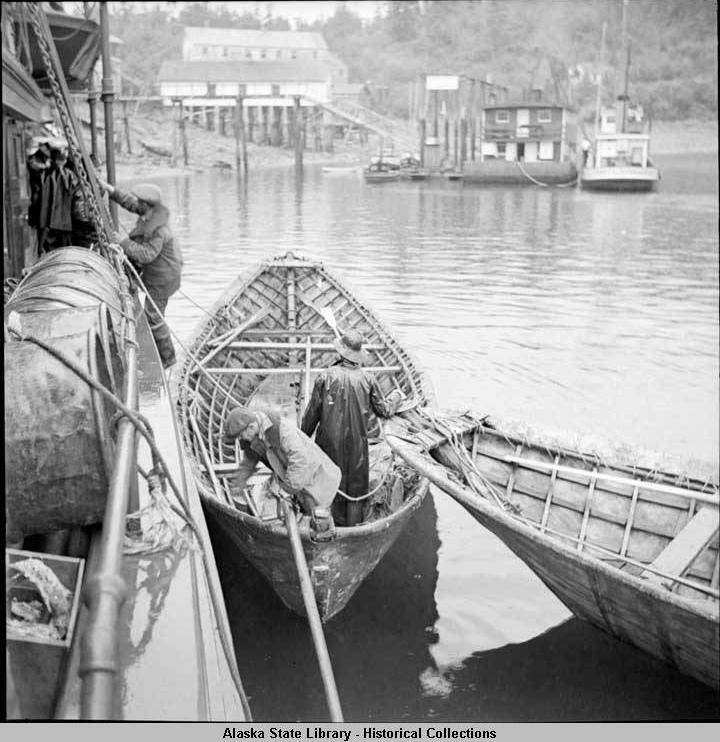 Swetzof, Helena, Burled at Funter Bay, Alaska. Swetzoff, Julia, Burled at Funter Bay, Alaska. Tetof, Doria, Buried at Funter Bay, Alaska. 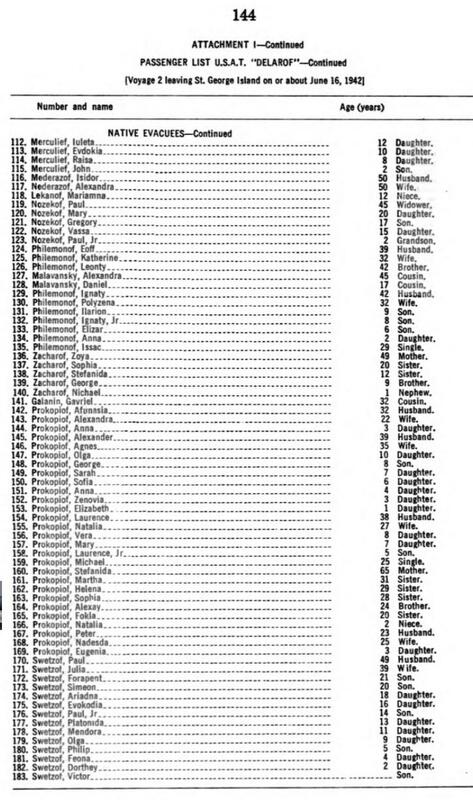 Below are some of the passenger lists from the USAT Delarof. Most “Native Evacuees” from St. Paul and St. George islands (about 477 people) were left at Funter Bay. Other communities were taken to Ward Lake, Burnett Inlet, Wrangell, and Killisnoo. Non-native or white government employees from the islands were given passage out of state, although a few stayed to help organize the internment camps. 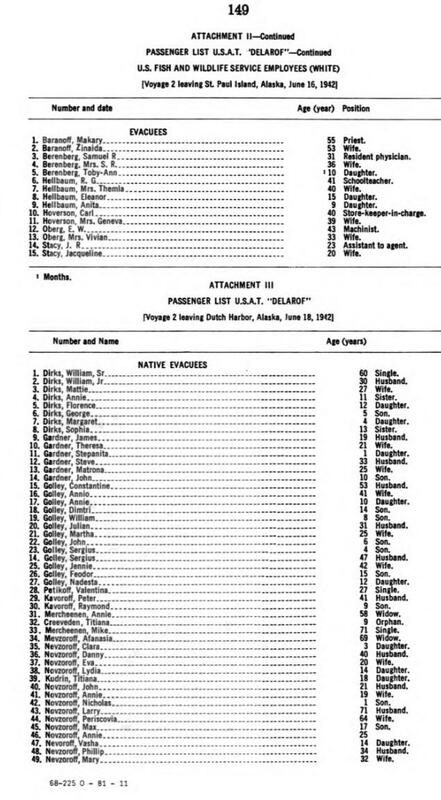 Passenger List USAT Delarof, Native Evacuees from St George Island to Funter Bay, Alaska. June 16, 1942. 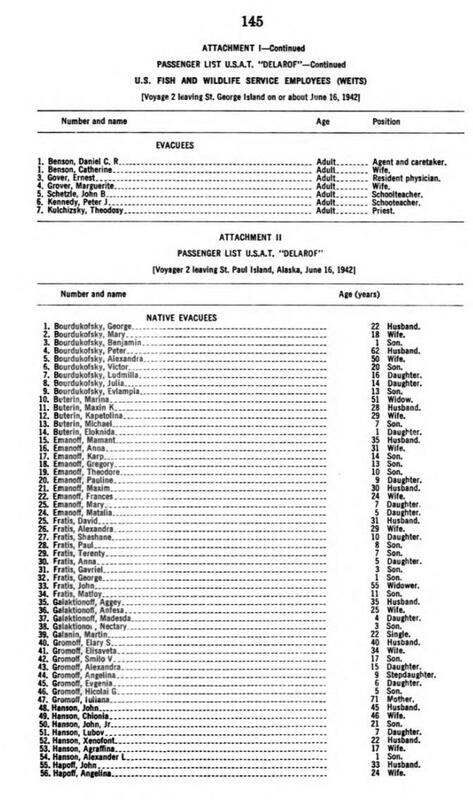 Passenger List USAT Delarof, Native Evacuees from St Paul Island and Government Employees to Funter Bay, Alaska. June 16, 1942. 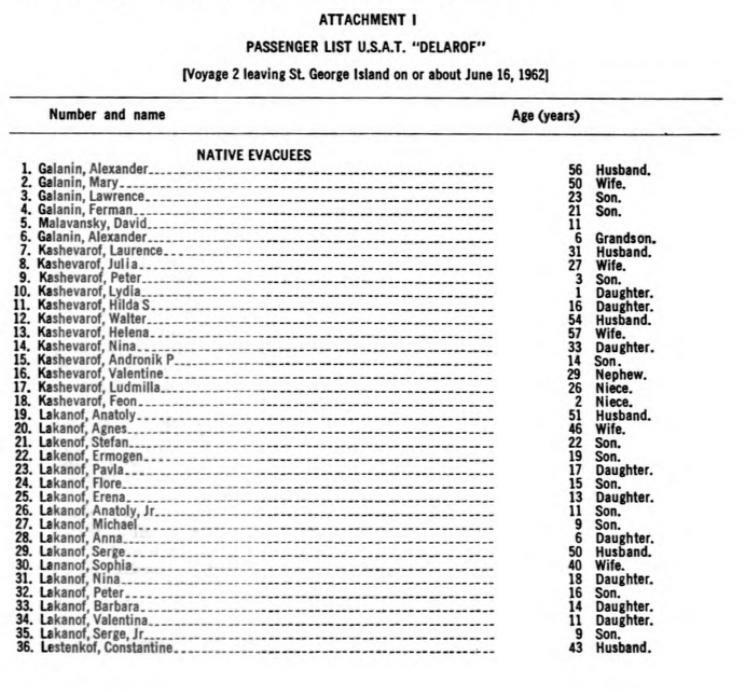 Passenger List USAT Delarof, Native Evacuees from St Paul Island to Funter Bay, Alaska. June 16, 1942. 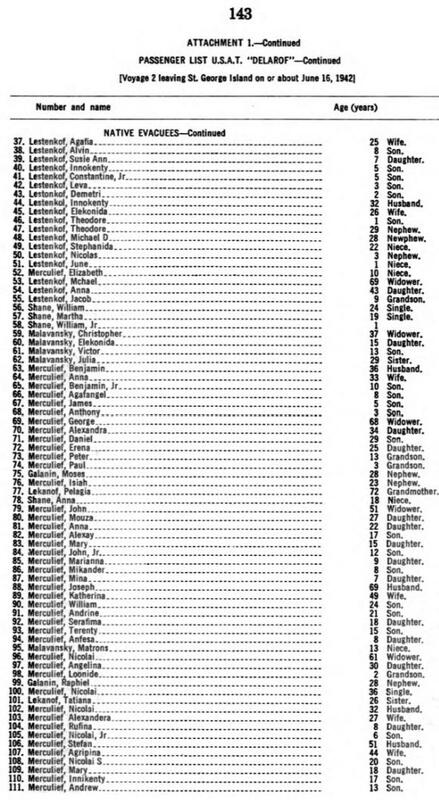 Passenger List USAT Delarof, Native Evacuees from Dutch Harbor and Government Employees from St Paul Island, Alaska. June 16, 1942. 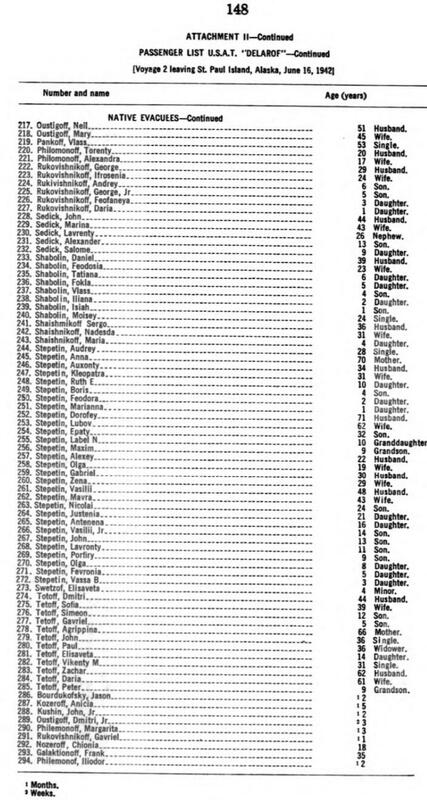 Passenger List USAT Delarof, Native Evacuees from Dutch Harbor and Nikolski, Alaska. June 16, 1942. Aleut Story. Video DVD with online bibliography of source material. Evacuation and Internment, 1942-1945. National Park Service page and archeological report by Charles Mobley. Agony of the Aleutians: The forgotten internment. A recent (November 2014) article. The Aleut Internments of WWII. Another recent (2014) print book. A darker page in the history of Alaska came during WWII, when the US government “evacuated” native populations in the path of Japanese invasion. This essentially meant shuffling them out of the way and then ignoring them. Funter Bay was one of the sites used as an internment camp for evacuees during the war. Charles Mobley has an excellent report documenting the evacuation and internment of Aleuts, and examining the architectural and archeological remains at Funter Bay. It came out in 2012 and is available from the National Park Service. It is also available online in PDF form at the prior link. Another article on the internment is available here. There is a documentary film available here. Some of the original WWII logbooks (excerpted below) can be found here. Japanese invasion of Alaska’s Aleutian Islands occurred in early June of 1942. The US government immediately forced native populations in that region to evacuate, with little notice and taking only what they could carry. This was supposedly for their own protection (villagers on Attu had been captured and taken to Japan). However, the military also wished to deprive the invaders of potential supplies and facilities (some villages were burned by the navy while the residents watched). As noted by Mobley, “The U.S. Military viewed the buildings as a potential asset to the enemy’s advance”. Islands which were evacuated included the Pribilof group of St. Paul and St. George, which lie north of the main Aleutian chain. These islands were settled permanently during the Russian development of Alaska, when Aleuts from other islands were moved there to hunt seals. Most of the residents were considered Russian citizens, became Russian Orthodox followers, and had Russian last names. After the US purchased Alaska, the Federal government closely controlled the islands. Ironically the American government was more oppressive towards religion, culture, and general freedom than the Russian government had been. Residents were kept under the thumb of the Fish and Wildlife Service, and were paid a small wage to hunt seals and maintain fox farms which profited the US treasury. 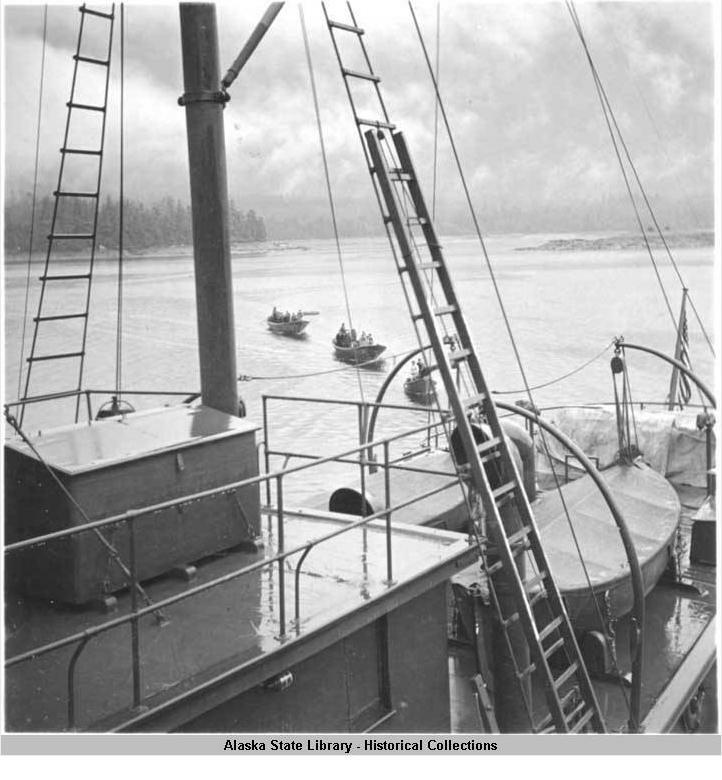 In mid June of 1942, Aleutian evacuees were transported to several sites in Southeast Alaska. The Pribilof residents were moved to Funter Bay, where the government leased the dormant cannery and mine to house them (Mobley notes that leasing agreements were still being finalized while the ships of evacuees were underway). Planning and funding were minimal to nonexistent, and evacuees were left largely to fend for themselves in un-maintained buildings with limited food or medical care. Islanders had at the last minute been allowed to bring a few small boats with them, and were expected to hunt and fish for much of their own food. Two USF&WS employees (Daniel Benson and Carl Hoverson) and their wives, along with two school teachers, Mr. and Mrs. Helbaum, were stationed at Funter Bay. These local agents repeatedly pleaded for support from their superiors and even attempted to resign over conditions at the internment camps, but were largely ignored. General knowledge was that German Prisoners of War housed in nearby Excursion Inlet had better conditions and better food than the Aleuts (US civilians) housed at Funter. By the time residents were allowed back to their homes permanently (except for islands taken over for US bases), over 10% had died in the internment camps. Despite the poor level of care, The Fish and Wildlife Service still considered the Aleuts to be their wards, or perhaps their indentured servants. In 1943 the F&WS coerced Pribilof men to leave their families at Funter and return to the theater of war to hunt seals and care for foxes on the government fur farm. I am not sure which ship is shown above. It appears to be smaller than the Delaroff, which transported evacuees from the Aleutians. USF&WS vessels which supplied the camps at Funter Bay included the Brant, the Penguin, the Crane, the Swan and the Scoter. These were closer in size to the vessel shown above. The boat tied to the scow appears to the the towboat Ketchikan. The Scoter was eventually assigned to spend the winter at Funter. 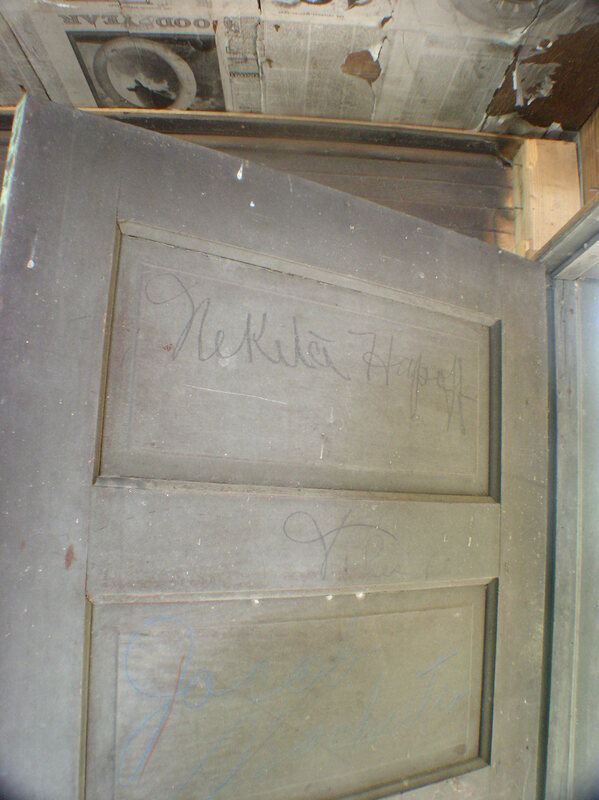 The names I can make out are “Nekita Hapoff” and “Jacob Kochutin”. A Nekita Hapoff is reported to have died at Funter Bay. “During the past cold spell it has been impossible to heat the houses and quarters occupied by the Natives. At night they have huddled around the stoves and in the dining room getting what little sleep possible. Most of the water pipes are still frozen and there still is no water in the reservoir behind the dam”. “Wednesday, Oct 27 1942: Three men down with bad colds, sore throats, and chills; this would indicate another outbreak of measles. All were medicated and sent to bed to ‘sweat it out'”. Another series of log entries chronicles the spread of the flu in late December, 1943. On Christmas Eve, 3 men at the St. George camp were sick, and by the 27th 10 at St. George and “Most of the workmen” in the St. Paul camp were sick. By December 31st, it seemed that only one man from each camp was well enough to work, at the sad task of building caskets. The log reports “All other men sick” (sick women and children were not listed). Tuberculosis and other respiratory issues were a major problem, possibly exacerbated by high local humidity (about double that of the Pribilof Islands). Infants and the elderly bore the brunt of illness and death. TB patients were sometimes sent to the hospital in Juneau, but flu and measles cases were ministered to mainly by F&WS staff. There were occasional visits from a doctor whose duties were split between multiple camps all over Southeast Alaska. When the doctor did visit he would only attend one camp at Funter, sick residents at the other camp had to be brought to him. An interview excerpt in Charles Mobley’s report notes that residents also became sick from eating unfamiliar foods such as out-of-season shellfish. Within a few months of arrival at Funter Bay, it was already necessary to construct a cemetery. 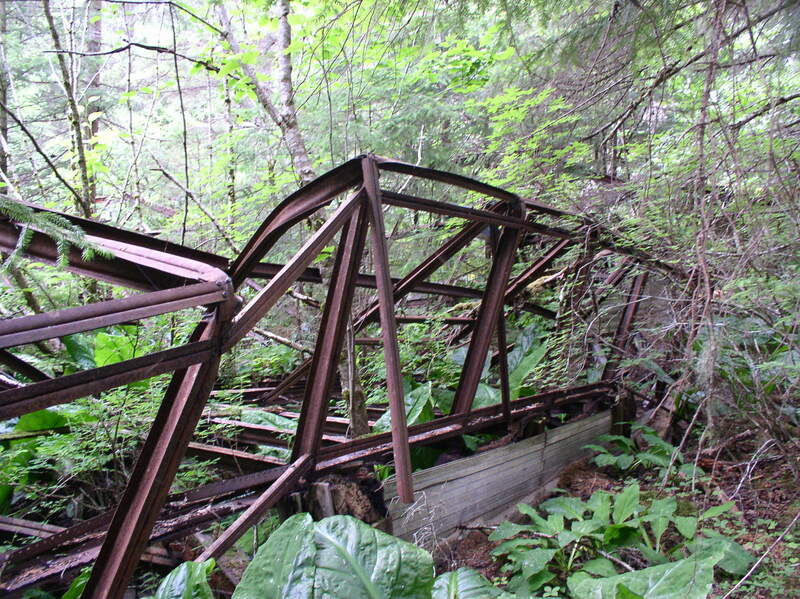 This was sited in the woods near the cannery. 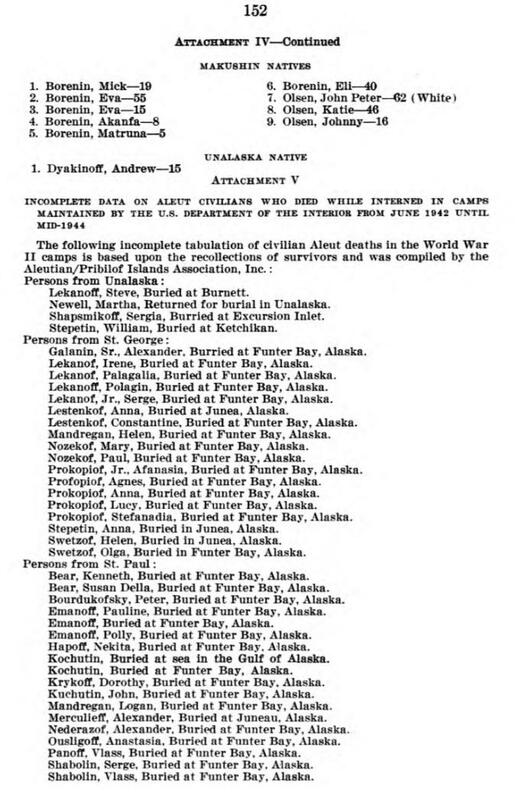 Thirty-two internees died at the Funter Bay camps or in Juneau hospitals. 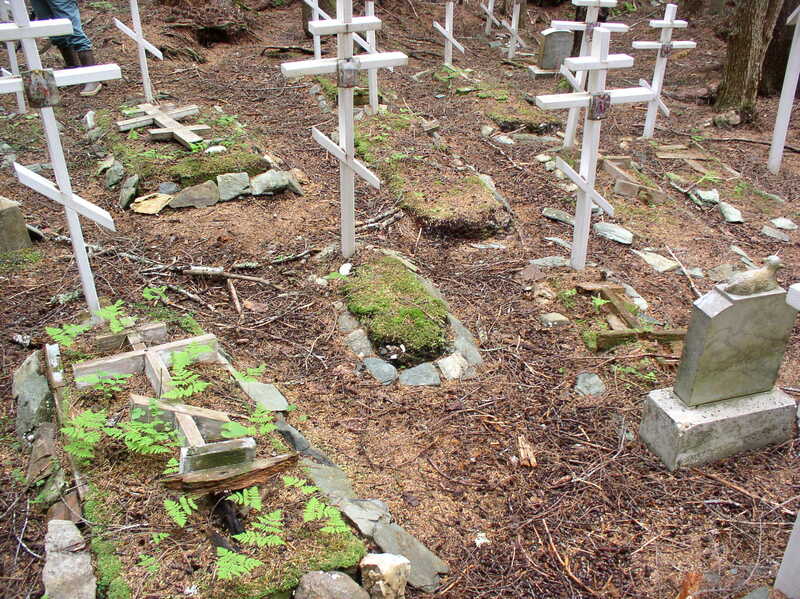 There are about 23 graves at the site, others are buried in Juneau. Note: If you are visiting the cemetery at Funter Bay, the best trail is on the right side of the beach, below the area of new growth trees. There is no access from the left side or middle of the cove. Please be respectful of the site, and of adjacent private property (all of the cleared area behind the beach is private). The cemetery is still visited and maintained by the families of those buried here. Islanders were allowed to return to their homes in 1945, two years after the Japanese had withdrawn from the Aleutians. The experience of Aleut internees in Southeast Alaska led to greater independence and less government control of their home islands, and eventual lawsuits and reparations for the government’s mishandling of the evacuation.